Yesterday, I attended the premiere of Polar Illusions' production of Disney's Aladdin. 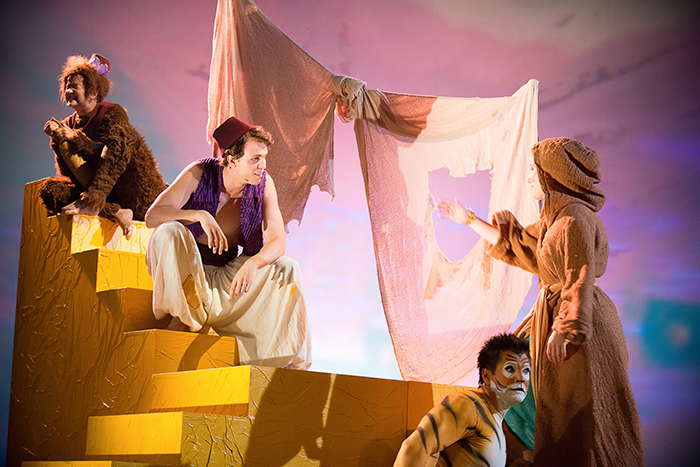 Polar Illusions is a brand-new company that specialises in musical theatre, and Aladdin, directed by Samuel Harjanne, is their very first show. The company mentions increasing the quality of Nordic musical theatre as their goal. I was curious to see if their first production is a step towards the right direction. I guess I could've also expected the musical to have very little actual music. The original movie has five songs and two reprises. Even though many songs were cut from the movie before it was released, only one of them made a return onstage, resulting in a musical with six songs and their reprises. The show, however, was quite short, so that didn't matter too much. The movie's songs are classics, they sounded amazing live. The one extra song... we'll come to that. The most interesting part about this production, to me, was the fact it's in both Finnish and Swedish (originally, this version was done in the USA in English and Spanish). It's nice to see bilingualism celebrated by a piece of theatre that uses both of the official languages of this country. Sadly, I can't help wondering if the script to the bilingual version was written by people who just don't really care. In my opinion, the bilingualism brought nothing new to the story. It sounded like a good idea that the people of the street and the court would speak different languages, and I was looking forward some commentary about how this affects the relationship in between the Sultan and his subjects. There was hardly any mention of that, you mostly had either these annoying narrator characters or one of the talking animals translating everything into the other language. The ending, where (very meek spoilers ahoy) the curse is lifted and the people of Agrabah are able to understand each other again, was anticlimatic. So what? The audience never felt for their problem. They could've also squeezed more jokes out of the language gap. When it comes to Aladdin and Jasmine, their animal sidekicks acted as their interpreters. Seemed like a copout to me. I'd have loved to see Aladdin and Jasmine struggling with the languages, understanding a word here and there, falling in love nevertheless and learning to understand each other as the story progresses... Where's the challenge if you have a translator with you at all times? Finally, I think the fourth wall was broken a time too many. I didn't care when the Genie did it, he's a supernatural creature - but a little of that stuff goes a long way. I think it'd been better if the rest of the characters had been unaware of the audience. When it comes to the cast, I enjoyed everybody. Highlights were Antti L. J. Pääkkönen as the Genie and Anna Victoria Eriksson as princess Jasmine. The former was full of energy and managed to fill the huge shoes worn by Vesa-Matti Loiri of the Finnish film dub, the latter has just the right amount of attitude, and, in my opinion, way too little time onstage and few songs to sing. Jon-Jon Geitel was not bad in the title role, either. Almost everybody had a crush on Aladdin as a kid, so it's again hard to live up the expectations – and while Geitel wasn't identical to the movie, I think he didn't disappoint. I've got a big problem with the villain Jafar. Not with the actor: Markku Nenonen did his best with the material he was given. But the material... Many Disney villains serve as comic reliefs. They have their one-liners and silly moments, but there's always the dark and evil side bubbling under. Too bad the musical's Jafar has no malice at all. Just mincing and prancing onstage. I think, for the campy moments to be funny, his default setting would have to be more serious. As Disney fans know, Jafar hasn't got a proper song in the movie, so I was happy they added one for him here - for about five seconds. 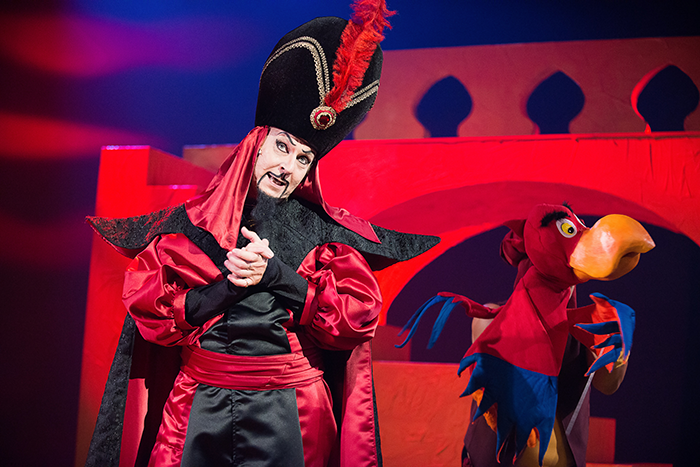 Jafar's solo was the least threatening villain song ever. For a bad guy like him, you think something among the lines of Be Prepared and Poor Unfortunate Souls... Nope. He got this. It's very easy to see why that didn't make it to the movie. Even though Jafar had a couple of moments to be genuinely threatening in the show, a song like that was quite enough to make the efforts useless. The villain became a clown, the story lost a part of its driving force. I liked the visuals of the production well enough. The costume designs especially were very close to the original movie - but, for whatever reason, it didn't bother me this time. It was actually nice to see the cartoon characters become flesh and blood like that. I suppose I wouldn't have minded a different take, either, but I wasn't annoyed by the replicating. 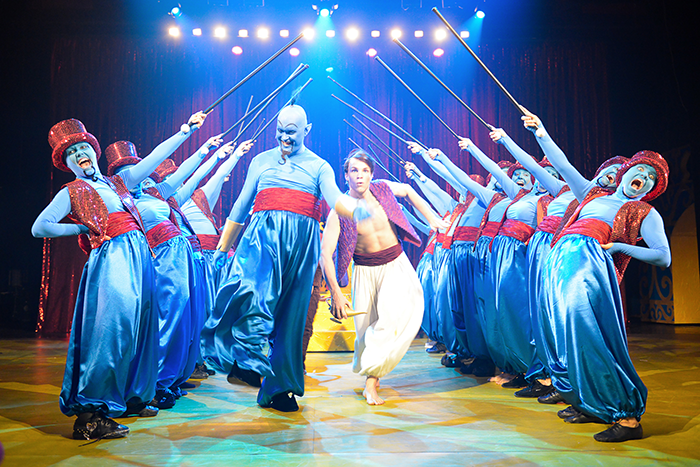 I think I was the most impressed by the way they staged the Genie's first song, A Friend Like Me. Matching the visual insanity of the movie scene must've been a hard task... having the whole cast as genies dancing onstage looked amazing! In short, however, I'm afraid Aladdin the musical doesn't rank too high on my list of musical adaptations. The cast and crew are talented, there are fun moments and good songs, but the script and especially the use of the two languages are a bit of a mess. If you're a huge Aladdin fan, you'll enjoy the movie better... and if you're not, you'll probably still enjoy the movie better. I'm still intrigued by the idea of bilingual theatre and wish Polar Illusions all the best for the future. It's clear the company has enough talent to create a great show. Let them just pick one with a more solid script next time. My blog entry from the time of Aladdin's press release event: click. Thumbs down for not singing the baklava line in A Friend Like Me in Finnish. Aw, dammit, there's so much you could get out of the bilingual theme. Pity that they apparenty haven't used their chances. Perhaps it would work better in an original story and not attached to a Disney movie that everyone knows? I'd like to see the musical, anyway, because such projects deserve attention, especially if they have a good cast and all and have really made the effort. By the way, who has done the translations? There's no mention of it on their website, which seems a bit odd when the musical's subject is languages and language barriers. Yeah, maybe it was a mistake to not go for an original story... But anyway, I'd say see the show if you're interested - the cast is indeed pretty amazing, and some of my friends liked the whole thing better than me.